#720 ARC ElastaHyde (white) reflects over 84% of Sun’s rays and serves as a thermal reflector due to hiding & reflective pigments. As an ENERGY STAR® Partner, Western Colloid has determined that this product meets the ENERGY STAR® guidelines for energy efficiency. 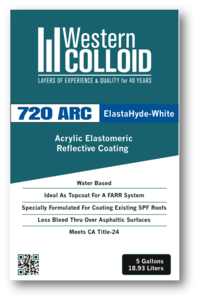 #720 ARC ElastaHyde is listed by the “Cool Roof Rating Council” and meets California Title 24 requirements. When cured #720 ARC ElastaHyde forms an extremely tough, flexible film that can withstand the most rigorous weather conditions. #720 ARC ElastaHyde is designed as a surface coating for Western Colloid “Fluid Applied Reinforced Roofing” membranes and metal roof systems. #720 ARC ElastaHyde is also recommended for use on conventional and modified built-up roofs and existing Spray Polyurethane Foam roofs. #720 ARC ElastaHyde can be reinforced with polyester fabric to form a complete Fluid Applied Reinforced Roofing system that meets UL Class A and Factory Mutual Class 1. Western Colloid’s #720 ARC ElastaHyde is a 100% acrylic, premium quality, high durability, elastomeric coating. It has been developed to protect various roof surfaces and contribute to substantial energy savings. ALSO AVAILABLE in #720 QS – Quick Set Formulation. This special formulation aids in the application of ElastaHyde when damp, wet or rainy weather is expected before the ElastaHyde has proper time to completely dry. IN ADDITION to white, ElastaHyde #720 ARC is available in “California Tan” and “Platinum Gray” which also meet California Title 24 requirements. Standard and custom colors are available. Recommended for use on conventional and modified built-up roofs. Ideal as topcoat for FARR – Fluid Applied Reinforced Roofing. Specially formulated for use as topcoat over existing spray polyurethane foam roofs. QS - #720 is available in a Quick Set formulation "ElastaHyde #790QS". It is designed to set-up faster, making it more resistant to wash-offs due to rain.